Two relatives of JeM leader among 44 people detained as part of crackdown against armed groups, interior ministry says. On February 26, 12 days after the JeM attack, Indian fighter jets bombed inside Pakistani territory, claiming to have hit a camp belonging to the armed group and eliminating “many rebels”. The dogfight resulted in the capture of a downed Indian air force pilot, who was releasedon March 1 as part of a “peace gesture” by Pakistan. Pakistan has announced that its envoy to India will return to New Delhi upon consultations in Islamabad after Pulwama attack, an official says. The consultations aim to de-escalate the ongoing tension between both nuclear neighbours, Mohammad Faisal, a Foreign Ministry spokesman, says in a statement. A Pakistani delegation will also visit the Indian capital New Delhi on March 14, followed by the return of the Indian delegation to Islamabad on March 28, to discuss the draft agreement on Kartarpur Corridor, Faisal adds. Pakistan’s military says the “situation along the LOC remained relatively calm”, but a 26-year-old man from the village of Dara Sher Khan was wounded because of Indian army fire that “deliberately” targeted civilians. In a statement, the military says its troops responded to the Indian fire. Pakistan’s navy remains vigilant and alert after detecting an Indian submarine near Pakistani waters, the statement adds. Pakistan has detained two close relatives of the leader of Jaish-e-Mohammed (JeM), Masood Azhar, as part of a new crackdown against armed groups, the interior ministry says. “Forty-four under-observation members of proscribed organisations, including Mufti Abdul Raoof and Hamad Azhar, have been taken in preventive detention for investigation,” the ministry says in a statement. “These actions will continue, as per the decisions taken in the National Security Committee (NSC) meeting on March 4, while reviewing the National Action Plan,” the statement adds. India’s navy chief says there are reports about terrorists being trained to carry out operations through the sea, according to local news agency PTI. “We have reports of terrorists being trained to carry out operations in various modus operandi, including through the medium of the sea,” Admiral Sunil Lanba says. “We recently saw the horrific scale of the extremist attack in Jammu and Kashmir about three weeks ago,” he adds, referring to the suicide attack on an Indian security forces convoy in the Indian-administered town of Pulwama. “This violence was perpetrated by extremists aided and abetted by a State that seeks to destabilise India,” the navy chief says without naming Pakistan. Pakistan’s navy says it successfully foiled an attempt by an Indian submarine to enter Pakistani waters. “The Pakistan navy used its specialised skills to ward off the submarine, successfully keeping it from entering Pakistani waters,” a statement from the navy spokesperson says. “In line with the government’s policy of maintaining peace, the Indian submarine was not targeted,” the statement adds. A video released by the navy shows grainy black and white footage of what appears to be a periscope above water. The timestamp on the video clip shows it began at 8.35pm local time (15.35 GMT) on Monday. After November 2016, this is the second time Pakistan has detected an Indian submarine trying to enter its waters. There was no immediate comment from Indian officials about the latest maritime incident. Pakistan is taking a range of measures to deal with armed groups, a government official says. In an interview with Al Jazeera in the capital, Islamabad, Fawad Chaudhry, the country’s information information, says a National Action Plan signed in 2014 proposed a road map for dealing with armed groups. “It is stated policy that we will not allow any armed groups to operate or use Pakistani soil and the monopoly on violence will rest with the state,” he says. “After that, we have taken many steps, but still there were some requirements that need to be filled, for example the FATF (Financial Action Task Force) requirements that largely deals with the funding of these groups,” Chaudhry tells Al Jazeera. The government of Pakistan passes a regulation authorising the seizure of assets of armed groups that have been sanctioned by the United Nations and also enlisted under Pakistani domestic anti-terrorism laws. “The objective of the UNSC (Freezing and Seizure) Order 2019 is to streamline the procedure for implementation of Security Council Sanctions against designated individuals and entities,” Pakistan’s foreign ministry says in a statement. The JeM group, Lashkar-e-Tayyaba and its charitable arms Jamaat-ud-Dawa and Filah-e-Insaniyat Foundation (FIF) are subject to the new measure. Pakistan’s military says its troops “responded effectively to Indian fire” from across their de facto border in Kashmir. There are “no casualties on the Pakistani side”, the military says in a statement. “Pakistan armed forces continue state of alert and vigilance,” it adds. Pakistan plans to take action against armed groups operating on its soil, according to a government official, amid global pressure to act after a suicide bomber killed 40 Indian paramilitary police in Indian-administered Kashmir last month. But Fawad Chaudhry, Pakistan’s information minister, denies Indian accusations that Islamabad was involved in the February 14 attack, which led to a sharp rise in hostilities, saying it “had nothing to do with us”. Chaudhry says the decision to act was taken at a meeting of the National Security Committee before the suicide bombing, claimed by armed group Jaish-e-Mohammad (JeM), in the town of Pulwama. “A full-fledged strategy is now in place,” Chaudhry tells Reuters news agency. “We have different strategies for different groups, but the main aim is that we have to enforce the writ of the state. We have to demilitarise if there are groups (on our soil),” he adds. Political parties seeking independence for all of the disputed territory of Kashmir from both Indian and Pakistani control are facing a fresh round of intimidation and legal action in the Pakistan-administered portion of the region, political activists have said. The government of Pakistan-administered Kashmir, known locally as Azad Jammu and Kashmir (AJK), denied that it has restricted space for pro-freedom parties and electoral analysts said those parties have historically had marginal support in the territory. The same parties in Indian-administered Kashmir regularly face arrests, arbitrary detentions and other alleged human rights abuses while in custody, activists tell Al Jazeera. Asad Hashim reports from Muzaffarabad. The operation of a bi-weekly cross-border train service between India’s capital New Delhi and Pakistan’s eastern city of Lahore has resumed, according to a Pakistani railway official. Ejaz Shah, Pakistan railways spokesman, said the train service, known as Samjhauta Express, left Lahore on Monday for India’s border town of Attari, with some 180 passengers on board. The neighbours agreed on Saturday to restart the rail link after suspending it last week due to the “prevailing tensions” between the two countries. The first train left India on Sunday. Pakistan’s Prime Minister Imran Khan said he is “not worthy” of the Nobel Peace Prize after growing calls on social media and by his ruling party to award him for his “sagacious” role in defusing tensions with India. “The person worthy of this would be the one who solves the Kashmir dispute according to the wishes of the Kashmiri people and paves the way for peace and human development in the subcontinent,” Khan writes on Twitter. .
Information Minister Fawad Chaudhry submitted a resolution to the National Assembly on Saturday, suggesting Khan, 66, receive the prestigious award. More than 400,000 people have signed an online petition calling for the prize be given to Khan. South African comedian and US TV show host Trevor Noah is under fire for joking about the recent tensions between India and Pakistan, with social media users criticising his comments as “racist”, “insensitive” and “stereotypical”. During an episode of The Daily Show, a satirical news programme, on Wednesday night, host Noah said that if the nuclear-armed neighbours went to war, “it would be the most entertaining of all time”. “It would also be the longest war of all time – another dance number!” he added while putting on an Indian accent and suggesting that a potential war scene would play out like a Bollywood musical. The playful satire drew outrage on Twitter, forcing the 35-year-old comic to apologise. Amid conflicting claims over the number of armed fighters killed in the Indian air attack inside Pakistani territory, the country’s air force chief said it is not their job to count casualties. Dhanoa’s response came amid a controversy over the Indian government’s failure to present evidence to back its claim that its attack had destroyed JeM camps in Balakot area in northern Pakistan and killed “a very large number” of rebels. On Sunday, India’s ruling Bharatiya Janata Party (BJP) chief Amit Shah claimed “250 terrorists were killed”. Residents of villages near the LoC said it was quiet overnight on Sunday, their first lull since the dangerous escalation between Pakistan and India erupted last week. In the Chakoti area in Pakistan-administered Kashmir, many villagers used the calm to leave their homes and move to safety. Nazakat Hussain said he has no other option but to leave because his family does not have underground shelters or bunkers to protect them. He told The Associated Press news agency that the rough weather and snow, along with the cross-border shooting, prevented his family from leaving earlier. Moazzam Zafar, a Pakistani government official, said 200 families are taking shelter in three large government buildings in the territory. Zafar said the authorities are providing warm clothing, bedding, food and medicine, and will establish more such camps. British Prime Minister Theresa May‘s office said she emphasised the importance of Pakistan taking action against all “terrorist groups” in a call with Prime Minister Imran Khan. “She welcomed his commitment to reducing tensions with India,” May’s office said. Hundreds of people gathered in Pakistan’s eastern city Lahore to protest against India’s decision on Thursday to ban the Jamaat-e-Islami (JeI) group in the disputed territory of Kashmir. India’s home ministry has accused the group of “unlawful association” and supporting rebellion in the region. The Lahore protest was organised by the political party Jamaat-e-Islami Pakistan. “Kashmir will become Pakistan,” chanted protesters holding Pakistan and party flags. The embassy of the United States in Islamabad said Washington is “seeking information” on whether Pakistan used US-built F-16 jets to down the Indian fighter jet, which may violate the F-16 sale agreements between the two countries. Pakistan says it did not use F-16s in shooting down the jet when it crossed the LoC that acts as a de facto border in Kashmir. Islamabad says this was an act of self defence. US often inserts restrictions on how its exported military hardware can be used through so-called end-user agreements. Pakistan’s cricket board announced that all eight matches of the country’s T20 cricket league scheduled to be held in Pakistan will now be played in Karachi due to “logistical and operational challenges”. The decision was made following the delayed resumption of commercial flights to the airport in Lahore, which was set to host three matches on March 9, 10 and 12, the board says in a statement. “Due to the recent and prevailing uncertainty, we felt it critical to make a decisive decision at this juncture,” PCB chairman Ehsan Mani said. The Pakistan Super League kicked off in the United Arab Emirates last month. The final will be played in Karachi on March 17. Pakistan’s ruling party joined a social media campaign advocating a Nobel Peace Prize for Prime Minister Imran Khan for his “sagacious” role in defusing tensions with India. The move came a day after Information Minister Fawad Chaudhry submitted a resolution suggesting he receive the prize to the National Assembly.. The resolution is likely to be tabled on Monday for a vote in the assembly, Sibghat Virk, a member of Khan’s Pakistan Tehreek-e-Insaaf (PTI) says. More than 300,000 people have signed an online petition calling for the award be given to Khan. The hashtag #NobelPeacePrizeForImranKhan began trending on Twitter after Islamabad handed back captured Indian pilot Abhinandan Varthaman as a “peace gesture” on Friday. Pakistan’s civil aviation authority says it is allowing restricted operations at the Allama Iqbal international airport in the eastern city of Lahore. This comes after the resumption of partial operations at Karachi, Quetta, Peshawar and Islamabad. Other airports in Gilgit Baltistan, Punjab province and the interior Sindh region remain closed, the agency said on Twitter. Pakistan’s foreign ministry said the world’s largest body of Muslim-majority nations has adopted a resolution urging India and Pakistan to de-escalate tensions and resolve their issues “through peaceful means”. The ministry said in a statement that at the end of a meeting in the United Arab Emirates, the 57-nation Organization of Islamic Cooperation (OIC) “reaffirmed its unwavering support for the Kashmiri people in their just cause”. It said the OIC expressed concern over this past week’s “Indian violation of Pakistani airspace; affirmed Pakistan’s right to self-defense; and urged India to refrain from the threat or use of force”. The resolution came a day after Pakistan’s foreign minister skipped the meeting to protest the host’s decision to invite India, a non-member. Pakistani authorities have received the body of a citizen killed in an Indian jail amid growing tensions between the countries, Pakistan’s foreign office has said. “India had failed to protect the Pakistani prisoner,” Foreign Minister Shah Mehmood Qureshi told in a press conference in the eastern city of Lahore. Shakir Ullah was allegedly stoned to death by inmates of Jaipur central jail on February 20. Pakistan has formally lodged a complaint with the Indian government and requested India to immediately provide the details of inquiry of the murder and post-mortem report, which have not been provided so far. Pakistan has demanded “safety of all Pakistanis, especially Pakistani prisoners in Indian jails to prevent recurrence of such tragic and reprehensible incidents”. Indian authorities handed over Shakir Ullah’s body at Wagah border, a day after Pakistan released an Indian pilot as a peace gesture to help calm tensions. India’s defence minister has met the pilot who was handed over by Pakistan on Friday in a “gesture of peace”. The ministry of defence released images showing Defence Minister Nirmala Sitharaman meeting Wing Commander Abhinandan Varthaman at an air force medical facility in New Delhi. The Press Trust of India news agency reported that the air force pilot debriefed the minister about his detainment in Pakistan. Varthaman was captured on Wednesday after his plane was shot down by the Pakistani military. Pakistan’s army says in a statement that two of its soldiers were killed in Nakiyal near the Line of Control in an “exchange of fire while targeting Indian posts undertaking firing on civilian population”. This brings the toll on both sides to seven since the release of the Indian pilot on Friday. Indian and Pakistani soldiers again targeted each other’s posts and villages along their volatile frontier, killing at least five civilians and wounding several others, officials on both sides said. Two siblings and their mother were killed by Pakistani shelling into Indian-administered Kashmir, police said, while a boy and man were killed by Indian shelling on the Pakistani side of the Line of Control. Four members of India’s security forces, two rebels and one civilian have been killed during gunfights in Kupwara district, Indian-administered Kashmir, according to local media reports. In response to a tip-off about the presence of rebels, security forces launched a cordon and search operation in Kupwara, The Indian Express newspaper reports, involving police and military personnel. The civilian, who died at hospital from a bullet wound sustained during clashes with security forces in a nearby area, has been identified as 21-year-old Wasim Ahmad Mir, according to an official statement by local police. Indian Prime Minister Narendra Modi says in a tweet India is “proud” of returned pilot Abhinandan Varthaman’s “exemplary courage”. Modi has been accused by opposition politicians of exploiting the ongoing confrontation with Pakistan for political gains ahead of India’s upcoming elections, which are scheduled to be held in April and May. Pakistan’s foreign ministry says in a statement Varthaman has been “treated with dignity and in line with international law”, and that his release is “aimed at de-escalating rising tensions with India”. Pakistan has released captured Indian pilot Abhinandan Varthaman, handing him back to Indian authorities after days of hostility between the nuclear-armed neighbours. He crossed over into India by foot, escorted by Pakistani troops and Indian diplomats. Al Jazeera’s Sohail Rahman, reporting from the Indian capital, New Delhi, said the processing of Varthaman’s return at the Wagah-Attari border crossing had appeared to have gone “according to plan, though the Pakistani’s have delayed the release of the Wing Commander at least three times during the day”. “We don’t know why there has been a delay, but it seems that the wing commander … is now on his way home,” Rahman said. Indian defence official Air Vice Marshal RGK Kapoor tells reporters at the scene Varthaman is being taken for medical checks. “This check-up is mandated particularly because the officer has had to eject from an aeroplane,” Kapoor says. Al Jazeera’s Kamal Hyder, reporting from Pakistan’s capital, Islamabad, said the situation remains “critical” following Varthaman’s release amid concerns over how to “defuse this escalating crisis”. “The Pakistani military is on full red alert, they are flying constant air patrols all over Pakistan and although the airspace has been open, the movement of aircraft between India and Pakistan, especially commercial aircraft is still under restrictions,” Hyder said. “What we are being told here in Pakistan is that the Indians are still in a belligerent mood, that Modi is trying to capitalise on this crisis for the elections coming up within the next two months,” he added. Al Jazeera’s Sohail Rahman, reporting from the Indian capital, New Delhi, said Wing Commander Abhinandan Varthaman’s release and return to India was likely going to be processed by the Red Cross as “neutral arbiters”. “We do not expect any sort of a press conference with the Wing Commander but there may be a press statement or a press conference with senior air force or military officials later in the day,” Rahman said, adding the pilot’s release was unlikely to end the ongoing row between Islamabad and New Delhi. “As far as India is concerned the situation is still very tense, Indian-administered Kashmir is still under curfew, there was a skirmish on Thursday with cross-border firing which resulted in the death of one woman … and earlier on Friday there has been an ongoing gun battle in the area of Handwara [in Indian-administered Kashmir] where four security personnel and one civilian have been killed,” Rahman said. Pakistan’s army chief Qamar Javed Bajwa has spoken with top military officials from the United States, Britain and Australia amid a volatile standoff with neighbouring India, according to a spokesperson for the country’s armed forces. Military spokeperson Major General Asif Ghafoor said in a tweet on Friday that Bajwa discussed the ongoing spat with India and its “impact on peace & stability in the region” in a call with US Central Command Commander Joseph Votel as well as with top British and Australian military figures. Bajwa vowed Pakistan would “surely respond to any aggression in self-defence”, according to the Twitter post. Ghafoor confirms Bajwa has also spoken by phone with the ambassadors of China, Britain, and the United States. India’s prime minister said a tough response by his country’s armed forces to recent attacks in Indian-controlled Kashmir have curtailed the influence of “terror” groups in the country. Prime Minister Narendra Modi pledged to curtail acts of “terrorism” further. Pakistani officials have brought the Indian pilot captured from a downed plane to the Wagah border crossing with India for handover. On the Indian side of the border, turbaned Indian policemen lined the road as a group of cheering Indian residents from the area waved India’s national flag and held up a huge garland of flowers to welcome Wing Commander Abhinandan Varthaman back. Pakistan plans to lodge a complaint against India at the United Nations, accusing it of “eco-terrorism” over air raids that damaged pine trees and brought the nuclear-armed nations to blows, a government minister said on Friday. Indian warplanes on Tuesday bombed a hilly forest area near the northern Pakistani town of Balakot, about 40km from India’s border in the Himalayan region of Kashmir. New Delhi said it had destroyed an armed training camp and killed hundreds of “terrorists” – which Pakistan denied. Climate Change Minister Malik Amin Aslam said Indian jets bombed a “forest reserve” and the government was undertaking an environmental impact assessment, which will be the basis of a complaint at the UN and other forums. Four Pakistani airports will begin partial operations on Friday with a full resumption of commercial flights on Monday, the country’s civil aviation authority said. The agency issued a statement on Friday saying some domestic and international flights will be allowed to and from the cities of Karachi, Islamabad, Peshawar and Quetta. It said full operations at all airports, including the one located in the eastern city of Lahore that borders India, will resume on March 4 at 1pm local time (08.00 GMT). Thousands of Indians, some waving flags and singing, gathered on Friday to give a hero’s welcome to an Indian air force pilot due to be returned across the border after being shot down by Pakistan. Media on both sides of the Wagah border crossing was pushed back around 1 kilometre from the border, sources told Al Jazeera. “He [Wing Commander Abhinandan Varthaman] will be debriefed by not only the secret service, but mainly the air force and there will be no media sound bites from him for the foreseeable future as and when he will come back to Indian soil,” said Al Jazeera’s Sohail Rahman, reporting from the Indian capital, New Delhi. “That is part of the protocol when you are, in theory, a prisoner of war,” he added. Pakistan’s foreign minister said on Friday he would not attend a meeting of the Organisation of Islamic Cooperation in Abu Dhabi this weekend because his Indian counterpart had been invited to the event. “I will not go to the council of foreign ministers,” Shah Mahmood Qureshi told parliament in the capital, Islamabad, adding that lower ranking officials would attend to represent Pakistan’s interests. Indian Foreign Minister Sushma Swaraj has been invited by the Emirati hosts as a “guest of honour” to the two-day gathering, set to kick off on Friday. Qureshi said India is neither a member of the 57-nation organisation nor has observer status. With India and Pakistan standing on the brink of war this week, several false videos, pictures and messages circulated widely on social media, sparking anger and heightening tension in both countries. Pratik Sinha, co-founder of fact-checking website, Alt News, said they had received requests to verify news from journalists and people on social media..
“It’s been crazy since Tuesday. There is so much out there that we know is fake, but we’re not able to fact-check all of it,” Sinha told Reuters news ageny. In Pakistan, a purported video of a second captured Indian pilot was being widely circulated. Fact-checking website Boom noted the clip was from an air show in the southern Indian city of Bengaluru, where two planes crashed on February 19. The founder of armed group Jaish-e-Mohammed, Masood Azhar, is in Pakistan and is “very unwell”, Pakistan’s foreign minister has revealed. “He’s unwell to the extent that he cannot leave his house. Thats the information I have,” Shah Mehmood Qureshi told the CNN in an exclusive interview on Thursday. “If they [India] have solid inalienable evidence, share it with us so that we can convince the people and the independent judiciary of Pakistan,” he added. Russian President Vladimir Putin has expressed hope for a prompt settlement between India and Pakistan, according to a Kremlin statement. Putin spoke to Indian Prime Minister Narendra Modi on the telephone on Thursday. The Russian leader expressed his condolences on the Pulwama suicide attack on February 14 that killed Indian paramilitary troops. “The two leaders condemned international terrorism and any methods used to support it, stressing the need to step up the uncompromising fight against the terrorist threat,” the statement read. UAE Crown Prince Sheikh Mohamed bin Zayed held telephone conversations on Thursday with both Prime Minister Narendra Modi and his Pakistani counterpart Imran Khan in an effort to defuse tensions between the two neighbours. “Mohammed bin Zayed emphasised on the importance of addressing recent developments and prioritising dialogue and communication,” according to his Twitter account. Turkish President Recep Tayyip Erdogan welcomed Pakistan’s announcement to release the Indian fighter pilot it captured after downing his jet, Prime Minister Imran Khan’s party said. In a telephone conversation, Khan and Erdogan discussed the recent tensions between India and Pakistan, as well as recent developments in the region, the Turkish president’s office confirmed. Indian government bans Jamaat-e-Islami (JeI) in Indian-administered Kashmir for five years, accusing it of supporting an armed rebellion in the disputed region that is at the heart of an escalating conflict with rival Pakistan. India’s home ministry said the JeI has been banned for “unlawful association” and for activities “prejudicial to internal security and public order”. India is welcoming Pakistan’s decision to free a captured pilot whose Mig-21 fighter was shot down in air raids this week, but top generals from the army and air force make it clear that their forces remain on high alert to respond to any “provocation” from Islamabad. “We are happy that our pilot, who had fallen across the line of control and was in the custody of Pakistan, is being released,” says R J K Kapoor, air vice marshal. “We are extremely happy to have him back. We want to see him back,” he tells reporters. In the village of Bakoot, just a few kilometers away from the disputed Pakistan-India frontier, an uneasy calm prevails during the day. But the nights bring sheer terror, with darkness accompanied by a furious exchange of artillery shelling. Read our correspondent Imran Khan’s dispatch from Pakistan-administered Kashmir here. India’s opposition parties and civil society groups are criticising Modi for continuing his scheduled public events, including an election rally, while staying mum amid a major military stand-off with Pakistan. Mike Pompeo, US secretary of state, says he has spoken with the leaders of India and Pakistan and has urged them to avoid “any action that would escalate and greatly increase risk”. Pakistan’s airspace will remain closed to commercial flights until 6pm local time (13.00 GMT) on Friday, the country’s civil aviation authority said. International flights have been rerouted, causing delays, instead of taking the normal route over the India-Pakistan airspace. Prime Minister Imran Khan says Pakistan will release the Indian pilot on Friday, two days after he was captured. “We have an Indian pilot. As a peace gesture we will release him tomorrow,” Khan told a joint sitting of parliament in the capital, Islamabad on Thursday. Pakistan’s army is on “high alert” along the Line of Control – the de facto border dividing Kashmir into two parts, each administered by India and Pakistan. “Pakistan armed forces are in a state of readiness for all eventualities,” a military statement on Thursday said. Pakistani Prime Minister Imran Khan is ready to speak with his Indian counterpart, Narendra Modi, on telephone, while offering peace, Pakistan’s foreign minister has said. Speaking to local television channel Geo News on Thursday, Shah Mehmood Qureshi said that Pakistan is prepared to return the captured Indian pilot if it helps reduce tensions. US President Donald Trump is hopeful that India and Pakistan may be on the cusp of progress after increasing tensions. “Hopefully that’s going to be coming to an end,” he said in the Vietnamese capital, Hanoi, on Thursday. It has been two weeks since the suicide car bombing in Indian-administered Kashmir that killed at least 42 Indian paramilitary troops, sparking tensions between India and Pakistan. British Foreign Secretary Jeremy Hunt has expressed concern at the current situation in the region, urging India and Pakistan to show restraint and de-escalate, Pakistan’s foreign ministry said. Hunt spoke to Pakistan’s Foreign Minister Shah Mahmood Qureshi on the phone on Wednesday evening. “The foreign minister added that the captured Indian air force pilot would be treated humanely in accordance with the Geneva Conventions,” the ministry statement on Thursday said. Signed in 1949 by representatives of 64 countries, the Geneva Conventions govern the protection for wounded members of armed forces, prisoners of war and civilians during armed conflict. The operation of a bi-weekly cross-border train service between India’s capital New Delhi and Pakistan’s eastern city of Lahore has been temporarily suspended due to the “prevailing tensions” between the two countries. “Samjhuta Express will resume its operations as soon as the security situation improves between India and Pakistan,” a statement by Pakistan’s foreign ministry said on Thursday. Pakistan’s airspace will remain closed to commercial flights until midnight on Thursday, the country’s civil aviation authority said. Pakistan International Airlines, the national carrier, advised its customers to expect further delays, adding that all flights were being rescheduled. India’s foreign ministry has told Pakistan’s acting high commissioner that New Delhi expects the immediate and safe return of a military pilot held by Pakistan after two Indian fighter jets were shot down over Pakistani airspace. “It was made clear that Pakistan would be well advised to ensure that no harm comes to the Indian defence personnel in its custody. India also expects his immediate and safe return,” the foreign ministry said in a statement on Wednesday. Al Jazeera’s Asad Hashim reports from the site of Tuesday’s air raid by the Indian Air Force and found no sign of serious casualties or structural damage. For villagers living on the de facto border between Indian and Pakistani-administered Kashmir, the threat of war is ever present. Even when there is not all out conflict, shelling and clashes between Indian and Pakistani soldiers are not uncommon. Journalist Rifat Fareed reports from the village of Silikot in the Indian-controlled side of the region, where she met residents whose lives have been scarred by conflict. 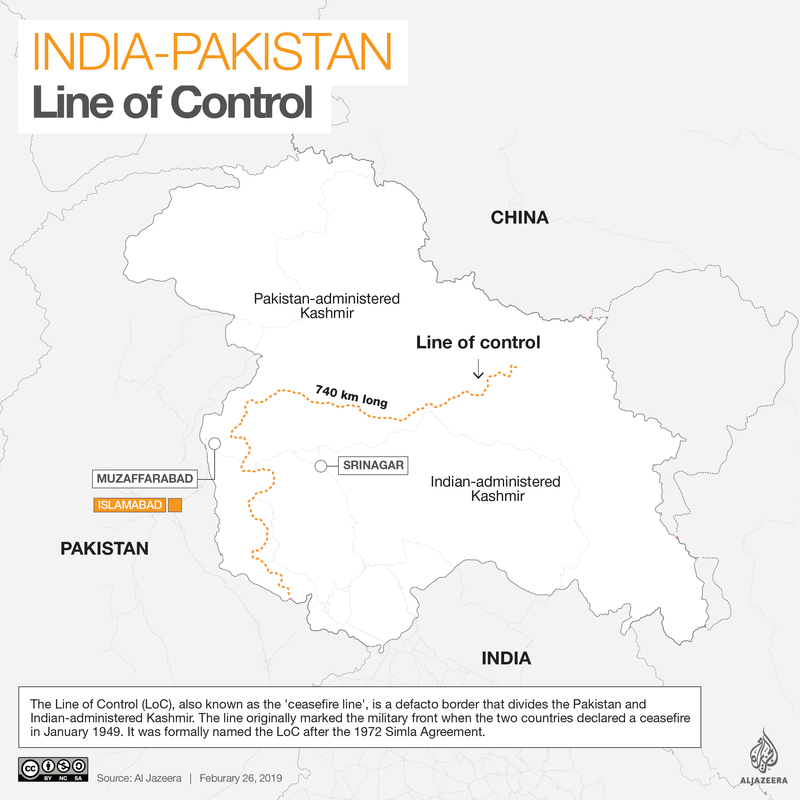 The Line of Control (LoC) is a 740km de-facto border separating Pakistani and Indian-administered Kashmir. Islamabad and New Delhi have fought two wars over Kashmir since independence, with the LoC being the focus of the hostilities. The actual line marks the military front when the two South Asian states declared a ceasefire ending the First India-Pakistan War. Iranian Foreign Minister Mohammad Javad Zarif spoke on Wednesday on phone with his Pakistani counterpart, Shah Mahmood Qureshi, and offered mediation between India and Pakistan, after rising tensions between the two countries. Zarif, whose Monday’s resignation was rejected by Rouhani on Wednesday, urged both countries to exercise restraint, the semi-official news agency ISNA reported. ISNA said Zarif is going to speak to his Indian counterpart as well but did not specify any date. Germany on Wednesday called on both Pakistan and India to de-escalate tensions after cross-border air raids set the region on edge. “The federal government makes an urgent appeal for both sides to refrain from steps that could further escalate the conflict,” German Foreign Ministry spokeswoman Maria Adebahr told a news conference in Berlin, adding that India and Pakistan bear responsibility for regional stability. In this explainer video, Al Jazeera looks at the history behind the conflict in Kashmir, and the factors that continue to fuel tensions. 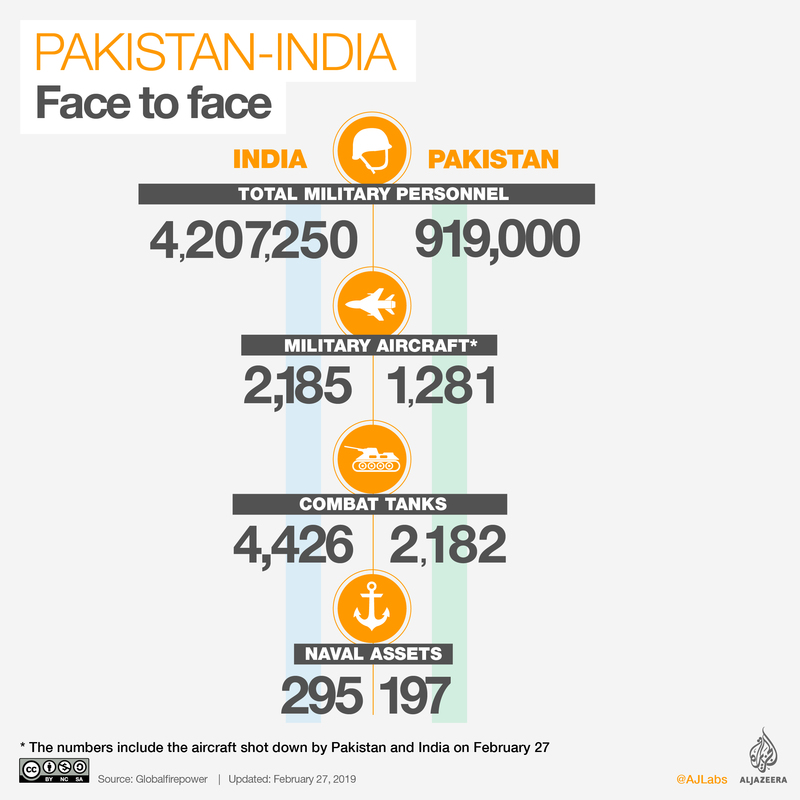 This handy data set gives you some idea of just how powerful India and Pakistan are. From the number of fighter planes and tanks, to the types of missiles each has, we have you covered. Airlines including Qatar Airways, Emirates, and Etihad, have cancelled flights to Pakistan and some parts of India amid heightened tensions between the two nuclear-armed neighbours. Federica Mogherini has urged the “utmost restraint” amid tensions between New Delhi and Islamabad. Indian media outlet NDTV says government officials in New Delhi have condemned Pakistan’s publication of video and images showing a captured Indian pilot. “India also strongly objects to Pakistan’s vulgar display of an injured personnel of the Indian Air Force in violation of all norms of International Humanitarian Law and the Geneva Convention,” the Indian government says in a statement. The comments come as Indian Prime Minister Narendra Modi meets military officers to discuss the capture of the pilot. Pakistan’s Prime Minister Imran Khan has urged his Indian counterpart Narendra Modi to negotiate an end to the current crisis. Pakistan Armed Forces spokesman Major General Asif Ghafoor, has said the Pakistani army holds just one Indian pilot. In an earlier comment, the military said it had two members of the Indian armed forces in custody. India says it has one pilot unaccounted for. UK Prime Minister Theresa May urged India and Pakistan to show restraint. “The UK is deeply concerned about rising tensions between India and Pakistan and urgently calls for restraint on both sides to avoid further escalation,” May told Parliament. “We are in regular contact with both countries, urging dialogue and diplomatic solutions to ensure regional stability. “We are working closely with international partners including through the UN Security Council to deescalate tensions,” May says. Dubai-based Emirates airline cancelled all flights to Pakistan and Afghanistan due to the closure of Pakistan’s airspace. The news followed a similar decision by Bahrain’s national carrier, which suspended all flights to Pakistan earlier on Wednesday. Turkey‘s foreign minister, Mevlut Cavusoglu voiced concern over the increasing tension between India and Pakistan. He pointed to the dispute over Kashmir as the source of the tension, telling reporters in the Turkish capital, Ankara, that it must be solved as soon as possible within the framework of international law. Pakistan’s Prime Minister Imran Khan said his country is ready for dialogue with India and urged the need for “better sense to prevail”. “I am addressing India. It is very important that we use wisdom,” Khan said in a televised address, emphasising that several countries have ended up at war in the past due to a lack of dialogue. He stressed the need for the two nuclear-armed countries to remain cool-headed and to cooperate on security in the disputed Kashmir, saying “we will go and fight with you against terrorism”. India said it shot down one Pakistani fighter jet and lost one of its own to Pakistan. Pakistan claimed to have shot down two Indian warplanes. India’s Foreign Ministry said one of their pilots is missing after Pakistan claimed to have captured two Indian pilots. Ravish Kumar, the ministry spokesperson, also stressed need to “ascertain the facts” amid competing narratives with Pakistan. “In this engagement, we have unfortunately lost one MiG 21. The pilot is missing in action. Pakistan has claimed he is in their custody. We are ascertaining the facts,” Kumar said. Bahrain’s national carrier Gulf Air has suspended all flights to and from Pakistan with immediate effect due to the closure of Pakistani airspace, according to a statement from the company. “On February 27, flights to/from Lahore, Multan and Islamabad are cancelled and all passengers will be transferred to next available flights when the airspace is open again,” the statement said. Retired diplomat Lalit Mansingh said a new red line with Pakistan has been drawn, adding that India’s policy of strategic restraint “is no longer”, according to the AP news agency. India and Pakistan confirmed the partial closure of their airspaces and suspension of commercial flights from several airports. Pakistan indefinitely closed at least three airports in cities located near the Indian border, military spokesman Asif Ghafoor told reporters. All international and domestic flights from major airports, including Karachi, Peshawar and Lahore, were also suspended for an indefinite period. Meanwhile, India suspended flights from airports in the disputed region of Kashmir and the state of Punjab until further notice, officials said. Pakistan’s military spokesman said the country does “not want to go towards war” with India. “We do not want escalation, we do not want to go towards war,” Major General Asif Ghafoor told reporters at a press conference in Rawalpindi, a city in western Pakistan. He adds that the two Indian pilots who have allegedly been captured are “being treated well”. One is currently in custody and the other in the hospital, he said. Pakistan’s military said two Indian pilots were captured after their planes were shot down over Pakistani airspace. India denied the claim, saying all its pilots are accounted for, according to local media. Indian news reports said that airports in Indian-administered Kashmir have been closed to civilian traffic shortly after an Indian air force jet crashed in the area. The Press Trust of India news agency said the airports are in Srinagar, Jammu and Leh. Indian authorities declined to comment. There were reports that several airports in Pakistan also closed, but Pakistan’s civil aviation authority said it cannot confirm that at this time. However, the website for the international airport in Lahore appeared to show a suspension of flights departing the city. China’s Foreign Ministry reiterated its call for India and Pakistan to exercise restraint. “We hope that both India and Pakistan can exercise restraint, take initiatives that are conducive to promoting dialogue, meet halfway and make active efforts for lasting peace and stability in South Asia,” Foreign Ministry spokesman Lu Kang said. Indian air force jets intercepted at least three Pakistani warplanes that crossed into Indian-administered Kashmir on Wednesday and forced them to turn tail, an Indian official says, amid heightened tensions following an Indian air attack that targeted a rebel camp inside Pakistan a day earlier. The Pakistani jets intruded over the Bimber Gali-Naushera sector at the Line of Control, a ceasefire line that serves as the de facto border in the disputed Kashmir region, the official, who is based in the area, said. The main airport in Srinagar, the summer capital of Jammu and Kashmir state, has been shut down for three hours, police in the city said. New Delhi is seeking to ease tensions with Islamabad as the US urges the nuclear-armed neighbours to “exercise restraint”. India promised to act, sending warplanes into Pakistani airspace and striking what it says was a camp of JeM, the group that claimed the February 14 Kashmir bombing. “The limited objective of that pre-emptive strike was to act decisively against the terrorist infrastructure of Jaish-e-Muhammad in order to pre-empt another terror attack in India,” Indian Foreign Minister Sushma Swaraj says during talks in Beijing with her counterparts from China and Russia.